Once a team that had a 17-4 stretch from November to mid-December, the Wild have plumetted to the bottom of the league standings and currently sit 27th overall in the NHL. They were once first overall in the NHL standings in late November, now they're near the bottom, which is one of the biggest falls of any team this season down the standings. 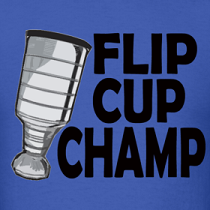 They will miss the playoffs for the 4th consecutive season, and while they're not that awful with a 31-34-10 record, they will finish the season with their worst record since the lockout. Despite only playing in 48 games this season thanks to three separate injuries that cost him 27 combined games, Mikko Koivu is 3rd in team scoring and 1st in assists. Being the teams leading scorer for the past three seasons, Koivu was definitely missed and his presence back in the lineup could spark the team to some victories and out of the Lottery. 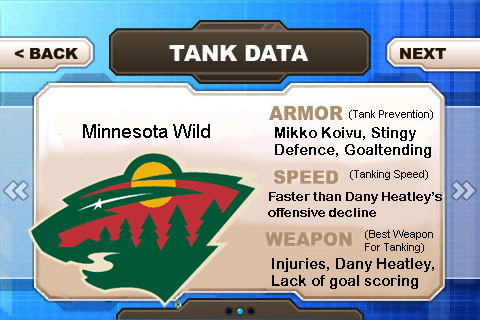 Other armoury for the Wild's anti-tanking are their stingy defence and goaltending. Despite being 27th overall in NHL, they rank 16th in goals against per game with 2.65 GA/G. That's better than their averages the past two seasons and if the Wild can get the solid goaltending that they can from their three goalies, they could find themselves picking in the 6-9 range. The Wild have gone 3-7-0 in their last 10 and face some pretty tough competition in their final seven games. All their remaining games are against playoff teams, and they could very well finish the season 0-7. Some of those teams are battling hard to squeeze into the playoffs (Los Angeles, Phoenix, Florida) while others are jockeying for home ice advantage (Chicago, Nashville, New York) so it's a safe bet to say the loose Wild will be playing some desperate teams. They could tank real hard these next two weeks. Injuries have played a factor for the Wild this season with big players like Mikko Koivu, Pierre-Marc Bouchard, and Devon Setoguchi all missing over 10 games this season. Those are some key players for the Wild so another injury for the team could secure a bottom five pick come June. The biggest thing to guarantee a top pick however will be their lack of goal scoring. Currently ranked dead last in goals for with 151 (a full 18 goals behind 29th overall), the Wild need to just keep their scoring pace going and they should score a chance at the #1 pick. A big part of their lack of goal scoring is the offensive decline of Dany Heatley who peaked as an Ottawa Senator and as seen his goal scoring touch fall off every year since. Heatley will definitely have a career low in points for a full season, and barring a scoring streak, a career low in goals for a full season as well. Not good for a 31-year-old Olympian. In the Greatest Tank Battles, the Wild will be looking to draft in the Top 10 for the third consecutive year, and their first Top 5 pick since drafting Benoit Pouliot 4th overall in 2005. They have the goaltending and defence to help win games, they just need to correct their lack of offence that has plagued the team the past 11 years since their inception. Maybe they'll get an offensive stud this year.